Adler-Bell, Sam. "Why White People Freak Out When They're Called Out About Race." Alternet. Alternet, 12 Mar. 2015. Web. 03 Nov. 2015. Ali, Maz. "A Study Reveals a Painful Truth behind a Story about Chris Rock's Neighbors." Upworthy. Cloud Tiger Media, n.d. Web. 03 Nov. 2015. Anderson, Rev. Denise. "'Allies,' the Time for Your Silence Has Expired." The Huffington Post. TheHuffingtonPost.com, 18 June 2015. Web. 03 Nov. 2015. Avila, Eric. "Why Is Studying 'Whiteness' Controversial?" History News Network. Roy Rosenzweig Center for History and New Media, 7 Feb. 2016. Web. 09 Feb. 2016. Ayvazian, Andrea. "Interrupting the Cycle of Oppression: The Role of Allies as Agents of Change." Mount Holyoke College. Mount Holyoke College, n.d. Web. Badger, Emily. "How the Whitest City in America Appears Through the Eyes of Its Black Residents." The Washington Post. The Washington Post, 24 March 2015. Web. Bennett, Brit. "White Terrorism Is as Old as America." The New York Times. The New York Times, 18 June 2015. Web. 03 Nov. 2015. Binder, Melissa. "Portland Is Racist and White Christians Need to Get Involved, Faith Leaders Say." OregonLive. Oregon Live, 22 Feb. 2016. Web. Binder, Melissa. "What White Christians Need to Know about the Black Lives Matter Movement." OregonLive. Oregonian/OregonLive, 30 June 2015. Web. 03 Nov. 2015. "Black boys viewed as older, less innocent than whites, research finds." Web News Wire. 8 Mar. 2014. Popular Magazines. Web. 27 July 2015. Blow, Charles M. "White America’s ‘Broken Heart’." The New York Times. The New York Times, 03 Feb. 2016. Web. 09 Feb. 2016. Burke, Meghan A. "Colorblindness vs. Race-Consciousness—An American Ambivalence." The Society Pages. W. W. Norton & Company, 24 July 2013. Web. Calderon, JLove, and Tim Wise. "Code of Ethics for Antiracist White Allies." . JLoveCalderon. 2014. Web. Coates, Ta-Nehisi. "Letter to My Son." The Atlantic. Atlantic Media Company, 04 July 2015. Web. 03 Nov. 2015. Coates, Ta-Nehisi. "The Case for Reparations." Atlantic 313.5 (2014): 54. MasterFILE Premier. Web. Coates, Ta-Nehisi. "The Enduring Solidarity of Whiteness." The Atlantic. Atlantic Media Company, 8 Feb. 2016. Web. 09 Feb. 2016. Coates, Ta-Nehisi. "What We Mean When We Say Race is a Social Construct." Atlantic. Atlantic Media Company, 15 May 2013. Web. Crossley-Corcoran, Gina. "Explaining White Privilege to a Broke White Person." Huffington Post. Huffington Post, 8 May 2015. Web. Fortgang, Tal. "Why I'll Never Apologize for My White Male Privilege." Time. Time, 2 May 2014. Web. 03 Nov. 2015. Harris, Tamara Winfrey. "Black Like Who?" New York Times 17 June 2015: A25(L). Infotrac Newsstand. Web. Kolowich, Steve. "White Like You: The Challenge of Getting White Students to Grapple With Racial Identity." Chronicle of Higher Education 61.38 (2015): A10. MasterFILE Premier. Web. Hsu, Hau. "The End of White America?" The Atlantic. Atlantic Media Co., Jan.-Feb. 2009. Web. Greenberg, Jon. "7 Reasons Why ‘Colorblindness’ Contributes to Racism Instead of Solves It." Everyday Feminism. Everyday Feminism, 23 Feb. 2015. Web. 30 Jan. 2016. Laymon, Kiese. "Black Churches Taught Us to Forgive White People. We Learned to Shame Ourselves." The Guardian. Guardian News and Media, 23 June 2015. Web. 3 Nov. 2015. Metta, John. "I, Racist." Those People. Medium, July 2015. Web. Novak, Matt. "Oregon Was Founded as a Racist Utopia." Gizmodo. Gawker Media, 1 Jan. 2015. Web. "Oakland Gospel Choir Draws Nuisance Complaint, Faces $500 A Day Fine." KPIX. CBS San Francisco, 14 Oct. 2015. Web. 03 Nov. 2015. Owens, Ali. "4 Problematic Statements White People Make About Race -- and What to Say Instead." The Huffington Post. TheHuffingtonPost.com, 19 Feb. 2016. Web. Painter, Nell Irvin. "What Is Whiteness?" The New York Times. The New York Times, 20 June 2015. Web. 09 Feb. 2016. Parks, Casey. "Portland Gentrification Video: This is Painful, But We Can Do Something." OregonLive. The Oregonian, 17 March 2015. Web. Rich, Frank. "Chris Rock Talks to Frank Rich About Ferguson, Cosby, and What 'Racial Progress' Really Means." Vulture. New York Media, 30 Nov. 2014. Web. 03 Nov. 2015. Simpson, Leanne. "An Indigenous View on #BlackLivesMatter." YES! Magazine. YES! Magazine, 5 Dec. 2014. Web. 03 Nov. 2015. Singh, Bobbin. "Pursuing Justice: Non-unanimous Verdicts Steeped in Racist Past." Portland Observer. Portland Observer, 02 Feb. 2016. Web. Vargas, Roberto. "Everyday Conversations to Heal Racism." Yes! Magazine. Yes Magazine, 4 March 2010. Web. Wade, Rick C. "Black American Has Been Playing By White America's Rules. If We Want Reconciliation, It's Time White America Share the Burden." Washington Post. The Washington Post, 17 July 2015. Web. "Whites Think Lighter-Skinned Blacks and Latinos Are Smarter." About.com Education. About.com, n.d. Web. 03 Nov. 2015. Woods, Baynard. "Only white people can save themselves from racism and white supremacism." Washington Post. The Washington Post, 19 June 2015. Web. Yancy, George and John Caputo. "Looking 'White' in the Face." The New York Times Blogs (Opinionator). The New York Times, 2 July, 2015. LexisNexis Academic. Web. "Slam dunk: Cop responds to kids 'disturbing the peace' by joining their game." 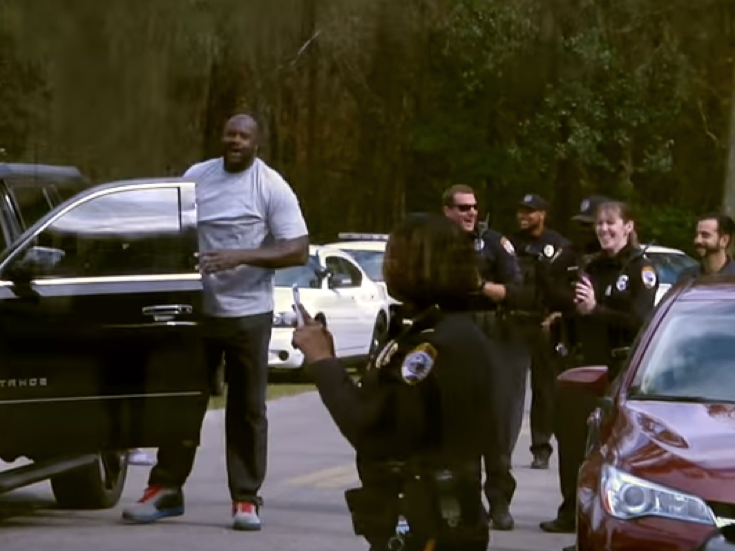 When Officer Bobby White from the Gainesville Police Department in Florida decided to investigate a noise complaint from a citizen, all he found was a bunch of young kids having fun playing basketball. So what happened next? Did White yell at them? Pull out the handcuffs? Draw his weapon? No. He joined right in and played with them. Richards, Doyin. "Slam Dunk: Cop Responds to Kids 'disturbing the Peace' by Joining Their Game." Upworthy. Upworthy, 2 Feb. 2016. Web. 09 Feb. 2016.